In a time, when aged people are proving easy targets for criminals and servants are looting their masters, a 77-year-old wife of a Goa liberation war martyr along with servants of a neighbour thwarted a burglary in her house near Rose Garden last night. 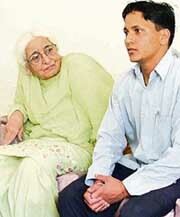 Ms S. Sidhu, a widow, and Mukesh, a domestic help, narrate how they thwarted burglary in her house. Supporting the nationwide call given by the All-India Bank Employees Association and the All India Officers Association, public sector banks here observed a strike today. Reacting to reports about some farmers cultivating two crops of rice in one season, Punjab Agricultural University has cautioned them against this practice. In what can be described as one of the biggest crackdowns against the drug trade to check unrestricted sale of intoxicating medicines, a team of all seven drug inspectors in the state today conducted simultaneous raids on 16 chemists shops at different places in the city and other towns and villages. Thousands of tablets, capsules, injections and bottles of addictive substances were seized. The Cabinet reshuffle by Captain Amarinder Singh, Chief Minister, Punjab, will help the Congress by toning up the bureaucracy prior to Assembly elections, claimed Mr S. S. Dullo, president, PPCC, and Mr Lal Singh, Minister for Food and Supplies, Rural Development, Panchayats, Jails and Civil Aviation. 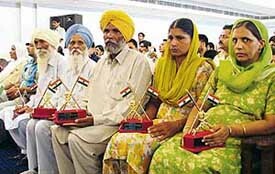 With their hearts bleeding and heads held high with pride, families of Kargil martyrs today called for world peace and expressed concern over reports that Pakistan was possessing around 50 nuclear weapons. As a part of the public information campaign launched by the Press Information Bureau (PIB) aimed at creating awareness among common people about the major programmes of the UPA govt , the Directorate of Advertising and Visual Publicity (DAVP), Chandigarh, organised a photo exhibition on the theme,“Safe motherhood” at Jifco Resorts here today. A frail poverty-stricken five-year- old-child, Vikas, suffering from acute lymphoblastic leukemia, is engaged in a battle of life and death. “We feel that we have moved into another part of our own country. The air, the ‘mitti’, the culture, a ethos are a same,” said the five-member team of theatre artistes from Pakistan. Mayor Nahar Singh Gill has said though the octroi will be abolished by this September but no extra taxes shall be levied on the common man as the government has sufficient funds. 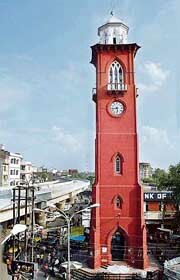 Ghanta Ghar, known as the city’s icon is 100-year-old and is dying fast. A look around the tall memorial built in 1906 is enough to drive home the point that there are no takers for heritage in this city which speaks business all the time. The very foundations of Ludhiana Victoria Memorial are eroding rapidly. The stone slabs at one of the four gates of the monument are already caving in as the earth underneath is eroding away. Several small to medium-sized peepal trees have come up on stone steps all around the building except at the front gate side. Some tiny peepals can also be spotted in the walls of the monument. These peepals if not checked in time can cause extensive damage to the walls. The old city has several buildings which have big peepals grown over them. That can happen with Ghanta Ghar also. A religious and historical drama based on the bravery of Bhai Sukha Singh and Mehtab Singh was staged at Sarabha Nagar Gurdwara here yesterday. The play titled ‘Ankhile Yodhey’ unfolded the Sikh history and bravery of these two warriors. Baba Sarbjot Singh Bedi, president of the Gurmat Sidhant Pracharak Sant Samaj, today criticised the Damdami Taksal chief Baba Harnam Singh for his acts and for joining hands with the Parkash Singh Badal faction. Industrialists of the town seek relief in power supply to the small induction furnace units in the state and to abandon the discrimination between the Arc furnaces and ordinary. This was stated by Mr Mohinder Gupta, president, Induction Furnace Association, while talking to mediapersons here on Saturday. He said such policies would ruin the industry. The Head Post Office, Bharat Nagar Chowk, Ludhiana, will function on Sunday, July 30. The plant clinic at Punjab Agricultural University, Ludhiana, has been receiving samples of blight attack on the Pusa 44 variety of rice. Due to bacterial leaf blight, greenish-yellow stripes appear along the leaf margins and extend both length-wise and breadth-wise. The leaf starts drying from the tip, becomes white in severe cases, and dries up completely. A quiz “We & Our Environment “ was held at Sacred Heart Senior Secondary School, BRS Nagar, here today for students of classes XI and XII. Four contestants from each of the four houses participated. The questions pertained to environment and participants were given multiple choice, visual and general rounds. 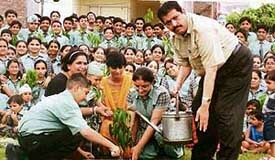 Students of Green Land School plant saplings during celebration of vanamahotsava week. The results of MA II (political science) of Guru Nanak National College, Doraha, were declared today. A majority of the students have achieved good results. Mr Sharanjit Singh Dhillon, President, Youth Akali Dal, has appointed Mr Malwinder Singh Kang as president of the Student Organisation of India, the student wing of the Shiromani Akali Dal (Badal). Mr Kang is a former president of the Panjab University Students Council. 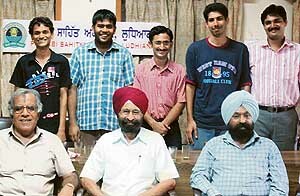 Bulls eye, Ludhiana, will organise a national level mock CAT series from July 30. Festivals always bring cheer and excitement to city people. 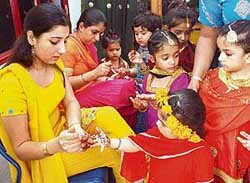 And young women take the lead in most of the celebrations, be it religious or cultural. Dr Kuldip Singh, Professor of Surgery at Dayanand Medical College and Hospital (DMCH) here was conferred “Rashtriya Rattan Award”. He was given a gold medal and a certificate of medical excellence by the International Study Circle and Institute of Economic Studies at New Delhi. 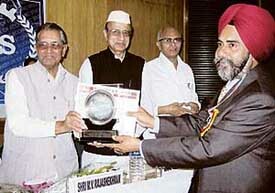 Dr Kuldip Singh, Professor of Surgery, Dayanand Medical College and Hospital, Ludhiana, receives an award at a seminar in New Delhi. 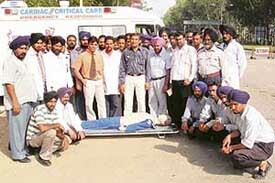 SPS Apollo Hospitals here has trained the first batch of 35 personnel of ambulance and patrolling vehicles in trauma life-support and extrication under the National Highway Authority of India (NHAI). Dr Sirish Chander and Dr Vikas Loomba were elected president and secretary, respectively, of the local chapter of the CMC Alumni Association in its general body meeting held here last evening. Ludhiana eves gave an excellent performance and advanced into the semi-finals on the second day of the 33rd Sub Junior Panjab Basketball Championship being held at Mansa.